`Original Maui Kitch'n Cook'd Potato Chips - Very Ono! Safeway, Times Market (old Star Supermarket), Foodland, ABC Store, etc. We can go through an entire bag before we get to the check-out counter at Star Market! We used to get a minimum of 2. The bag is clear with red and yellow writing. The chips look almost burned but are delicious! You can only find them on Maui. They are made at the Maui Potato Chip Factory, under ownership by the Kobayashi family since 1956. Warning! - In 2009 they were $4.00 a bag. In 2016 they were $7.50 a bag, in 2018, $9.00! We are now eating more Taro chips and less Maui chips. 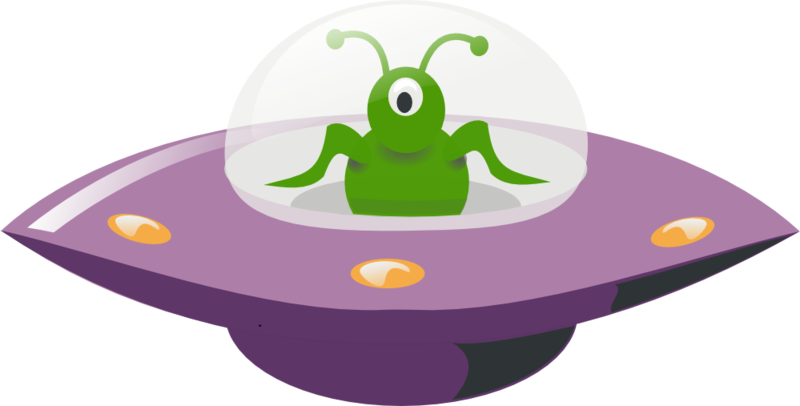 What is POG? It's a rich and sweet mixture of passion fruit juice, orange juice and guava juice. You can find it everywhere on the islands. 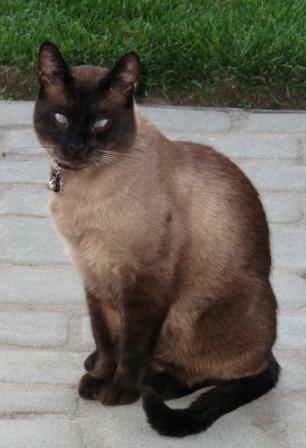 It was created in 1971 by a food product consultant named Mary Soon who worked for Haleakala Dairy on Maui. We buy it by the gallon at Costco (or any grocery store) and drink it for breakfast, lunch and dinner (with rum for an island mai tai). 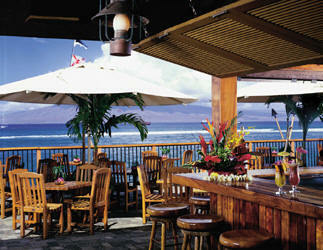 Our philosophy is, while we are on Maui, why not eat where you can enjoy the beautiful ocean views. There are so many good restaurants with ocean views. This is probably our all-time favorite. The bar is right on the water - great mai tais, pupus and Hula Pie - on the expensive side but worth it. (We prefer to have pupus and mai tais in the bar for dinner with the water at our feet.) They have entertainment on the bar level. The restaurant is upstairs, open to the water with a view of Lanai, however, most or the tables do not have much of a view. Hula Grill **** In Whaler's Village on Ka'anapali - right off the beach. This is probably our second favorite restaurant. Eat in the outside Barefoot Bar with your toes in the sand. You can also order from the full restaurant menu. They have nightly entertainment. Go at sunset. They make great Mai Tai's and Hula Pie. It is run by the same company (TS Restaurants) as Kimo's. Leilani, just across from Hula Grill, is also a TS Restaurant. Cheeseburger in Paradise *** Front St., Lahaina – Go to the upstairs bar for the best view. Cheeseburgers are okay but the view is great. So-so entertainment evenings upstairs. Frida's **** Across Front St. from The Cannery. They serve "Authentic and Eclectic Mexican Cuisine as well as some inspired dishes from Central and South America!" Outside seating right on the water. We love the Ceviche Tostada with Avocado with a Maui Bikini blonde beer on tap. 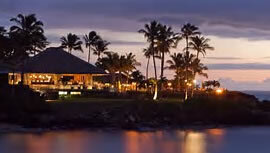 Tiki Terrace/Tiki Bar and Grill - at the Ka'anapali Beach Hotel (KBH) *** Daily around 6:30 PM. Call 661-0011 for information. Watch the show for free from some seats around the edges of the audience or sit at the tables in the center of the audience (waitress will expect you to order drinks or snacks). This will take you right back to the 50's. They even have "hula dance lesson" if you are so inclined! 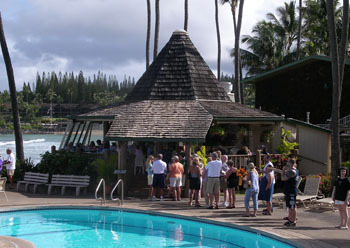 Cliff Dive Grill **** At the Sheraton on Ka`anapali Beach. We loved the Kalua pork taco. The Mahi mahi taco is also excellent. It's a great place to watch the torch lighting and the cliff dive at Black Rock at sunset. Also, hula dancing. At sunset, as a lei-bedecked young man lights torches throughout the hotel, a narrator takes you back in time to the 18th century, when Maui’s King Kahekili proved his courage and prowess by making numerous dives from the adjacent 40-foot promontory called Pu’u Keka’a (Black Rock). After a dancer performs an ancient hula, he climbs Pu’u Keka’a, tosses his lei into the waves as an offering to the kupuna (ancestors) and, recalling Kahekili’s feats, dives into the ocean with sunset as a beautiful backdrop. Open air on Napili Bay for breakfast. The Macadamia Nut pancakes are the best!! View of Lanai and Molokai and whales early in the year. Breakfast and lunch 7:30 am - 2 pm. Unfortunately, lots of folks have discovered The Gazebo. The line forms early!! We get there before 7:00 to make the first seating. They have coffee available while you wait and it's always interesting talking to the folks around you. Old Lahaina Luau *****(808) 667-1998 https://www.oldlahainaluau.com/ around $125 each. If you've never been to a luau, this one is wonderful. It's right on the water - great traditional food, beautiful sunset and entertainment. Go early to wander and see the imu and poi making before dinner. Honokowai Okazuya and Deli ***** 3600 Lower Honoapi'ilani Road. Open 10 AM to 9 PM, closed Sundays. 665-0512 (they take phone orders – waits can be long) Best buy on the island! It’s mainly a take-out - very limited seating. The original owner was a chef at Mama's and they have kept the same recipes!!! Great prices and great food. You get an entrée, rice and veggies or macaroni salad for $10 - $17. The portions are large - we often share a dinner. Our favorite entrées are Mahi Mahi Lemon Caper Mushrooms, Thai Chili Salmon, Blackened Ahi, or the day's fish special. This is a great alternative if you're tired of eating out but don't want to cook. 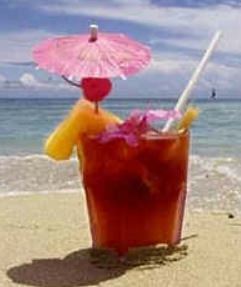 We pick the food up, go back to our condo, make mai tais and enjoy the sunset and dinner on the lanai or beach. They are CLOSED SUNDAYS and accept CASH ONLY, so plan accordingly. This is where we fell in love with Poke. Their fish is super fresh fish caught daily and served fresh and tasty. Fresh fish fillets ready to take home and grill with marinades, preparations, and cooking tips or, they can cook it up for you. As you walk in, the left counter is to order sandwiches, tacos (very ono), soup, and such. They are known for their Ahi and Ono burgers. The right counter is to order fresh fish. We love to take out ahi poke (medium spicy - they make it to your liking), fish ceviche and Ocean salad. China Boat - on Lower Honoapi'ilani Highway north of Ka’anapali – Chinese take-out – others have recommended but we haven’t tried it. Their hot and sour soup is highly recommended. In Pa'ia - 20 minutes east of the airport – one hour drive from Ka'anapali. A Maui legend. 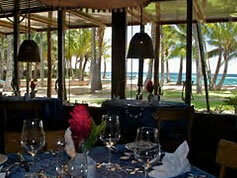 Great innovative food and decor, on the water - on the expensive side. Lunch prices are more affordable. Their ceviches and Lilikoi Crème Brûlée are wonderful. In the last few years, once we touch down on Maui, we fetch our bags, pick up our car, and head straight from the airport to Mama's for lunch. Great way to start your stay in Paradise. On the point between Napili Bay and Kapalua Bay, overlooking Moloka'i. Make earliest reservations possible to get a front row table for sunset. This has become our favorite "Last Night There" restaurant. Pacific ’O ***** 505 Front St., Lahaina 667-4341 Right on the beach. Fabulous view of Lana'i. Make reservations for about 1 hour before sunset! Food is very fresh and very innovative! The Feast of Lele Luau is next door and you will see the actors and hear the music. There are many, many more restaurants that we haven't tried (usually because they aren't on the water). I'm sure some are wonderful. These are our favorites that we go back to over and over again. We tend to eat at home every few nights to save our stomachs, waistlines and budget. We love to BBQ at sunset with a mai tai in hand then dine on the lanai - or bring home takeout from Okazuya or the Fish Market. Here are some quick, easy and tropical ideas. Pour proportions to taste!!! Garnish with a slice of pineapple - and maybe an umbrella!! Cut pineapple into quarters lengthwise through the crown, using a sharp knife. Remove core from each quarter. Then cut between shell and fruit, separating fruit from the shell in one piece. Leaving fruit in place, cut into 5-7 crosswise pieces then down middle to make 10-14 bite sized pieces (depending the size of the pineapple). Cut the pineapple flesh away from the rind. On a toothpick, spear a cherry/raspberry/strawberry, then a mandarin orange section and stick into one of the pineapple sections. Mix all of these ingredients together in a large bowl. Spread mixture onto French bread and bake in the oven or under broiler until cheese melts and bread browns. Remove from oven and slice into bite-size servings. In a shallow pan, thoroughly blend meat marinade with pineapple juice, rum and ginger. 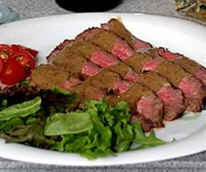 Place steak in marinade. Pierce all surfaces thoroughly and deeply with a fork. Marinade 15-30 minutes turning several times. 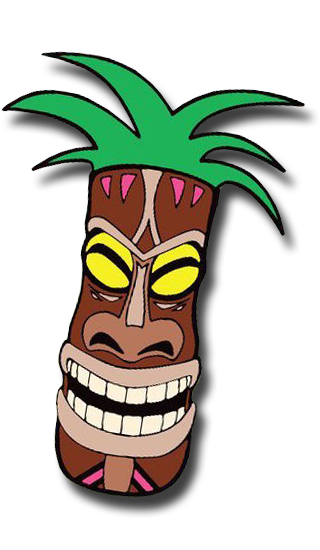 Remove from marinade; drain, reserving remaining marinade for mai tai sauce. BBQ or broil for 5-8 minutes each side turning once. Transfer steak to a carving board; carve meat in thin, diagonal slices. Blend well. Bring sauce to a boil; reduce heat and simmer for 5 min. Serve hot over sliced flank steak. Marinate in Veri Veri Teriyaki (or Kikkoman Teriyaki Sauce) for 1 hour or more. Kalua pua'a, or roast pork, as it's prepared in the Hawaiian imu or underground steam oven. Kalua pork is usually seasoned with sea salt and sometimes green onions. Rinse pork with cold water and place in medium roasting pan..
Rub Hawaiian (or sea) salt on pork and add water. Cover pork with ti leaves and cover roasting pan with aluminum foil. Bake at 350 degrees for 2-3 hours, or until meat is soft. Remove foil and ti leaves, de-bone and shred pork; add more Hawaiian salt if needed for taste. Sauté garlic. Add mushrooms and onion and cook 3 minutes. Add peas and cook a few more minutes leaving them al dente. Season to taste. Brush a little oil on both sides of fresh pineapple slices. Place on the grill. Grill a few minutes on each side. Using bamboo skewers (soaked in water about 30 min. ), alternately skewer chunks of pineapple, red & orange bell pepper, and onion chunks. Brush with a little olive oil. BBQ a few minutes on each side. This is a very basic recipe for ahi poke, but our favorite. The simpler the better! Add all ingredients except ahi and avocado, adjust to taste. Then, add the ahi and avocado and gently mix. Chill. Serve with won-ton chips, taro chips or tortilla chips. Polynesian Ceviche (Poisson Cru)- because of the number of ingredients, this is most likely better made at home. Sea salt (it takes more than you think - taste test. Place the ahi into a bowl. Pour the lime juice over. Add all the other ingredients. Gently mix well. Taste for salt and peppers. Add more if needed. Serve in clam shell, wooden or clear bowl placed on a ti or banana leaf. Garnish with cilantro or green onion. In Hawaiian the word Ahi means “fire”. While being hand lined aboard the Hawaiians’ canoes, the fish would make fierce runs causing the line to smoke where it rubbed against the wooden canoe. Ahi is of the tuna species and is delightfully delicious when quick broiled and served with a teriyaki or ginger sauce or just sliced and eaten raw as sashimi or in poke. A true favorite among seafood lovers world-wide. Mahi-mahi often gather in schools and are found throughout the Pacific. This fish is a moist, flaky, mildly flavored, sweet light pink flesh that when cooked turns white. It is delicious when baked with macadamia nuts and topped with white wine and lemon butter. Or just plain off the BBQ!!! Ono means good to eat in Hawaiian. Also known as Wahoo, this is a white, flaky, delicate, sweet, lean fish that has gained popularity in restaurants in recent years as chefs have looked for a substitute for Mahi-mahi. Ono is delicious when quick broiled and topped with lime butter or lemon caper butter. Long-Tail Red Snapper is often caught from depths of over 1,000 feet. Onaga is the premium of snappers and a local favorite. Pink Snapper from the deep sea. Opakapaka fillets are moist and delicious. Also known as Pompano or, when under 12 pounds, as Papio. Ulua can be caught by rod and reel from shore and are the most sought-after inshore fish in Hawaii. It has has firm, dense, slightly oily meat. Silver Mouth Snapper is similar in looks to the Opakapaka with the exception of their tuna-like mouth. Lehi is slightly stronger in flavor than Onaga or Opakapaka but is very tasty. This is a deep water fish rapidly gaining popularity in Hawaii. Declared by most professional chefs as a fish with special appeal, the monchong has medium-firm flesh, a moderate flavor and a high fat content well-suited for broiling. 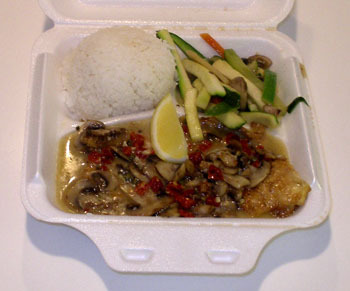 Hawaiian Kanpachi is taking the culinary world by storm. They are a member of the yellowtail (hamachi) family. Kanpachi is a great fish for sushi because it has delicate taste, not too oily, soft, meaty, easy to chew. GMO-free and organically grown, they are farm-raised in the deep, open ocean waters off the Kona coast and are gaining the approval of the Seafood Watch, a program hosted by the Monterey Bay Aquarium.